Need advice about a specific Chevrolet Impala / Monte Carlo problem? Chart based on 80 repairs. 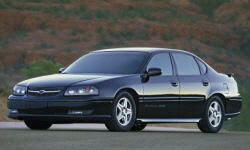 See TSBs and recalls for the 2002 Chevrolet Impala / Monte Carlo. Chart based on 63 repair trips. The repair cost chart excludes repairs made under warranty, do-it-yourself repairs, and repair trips that include maintenance. 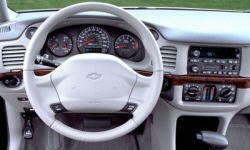 See repairs for all Chevrolet Impala / Monte Carlo model years. 122200 mi While driving, I noticed the engine was running roughly. I tested the ignition coils and noticed that two were beginning to fail. I replaced these using pre-owned coils obtained from a friend for free. 128000 mi The radiator fans stopped turning. I checked the motor and one is burnt out and the other is not but they do not work independently. I have not repaired because the engine will not overheat in the winter if I don't use air conditioning. 132000 mi Seatbelt light comes on at odd times. I have not fixed this and do not intend to. It seems to be ok if I push the seatbelt in. Driver's side lock cylinder refused to turn with a key (although I could unlock from other side) maybe because of cold, low humidity or possibly due to wear. I didn't fix it and after a few days it started working again. US $80 Replaced radiator fan due to fan no longer working. 69000 mi The steering was cracking every time I would turn a corner. The security system could not be fixed. The automatic lighting shorted out so lights would flash on and off at night. The fan sensor would not work so car would over heat all the time. Fan sensor was replaced and still would not work. The computer was replaced the car still wouldn't run right. US $150 Plastic elbow from intake manifold to belt tensioner assembly cracked, leaked antifreeze Valve cover gaskets leaking oil onto exhaust manifold causing smoking from under hood. Risk of fire. Replaced valve cover gaskets. US $350 Code P0300 Random/multiple cylinder misfire. Replaced Mass Air Flow Sensor, Spark plugs, Spark plug wires, Fuel filter, PCV valve, Camshaft position Sensor. Real Problem was Ignition Control Module which has no specific code if bad. US $50 ABS light on. Found to be short in wiring harness to right front wheel speed sensor. Purchased new section of wiring harness that goes from right front wheel speed sensor & spliced into main wiring harness. US $200 Front hubs/wheel-bearings were bad. Replaced wheel bearings. Sway bar link bad on front driver's side. Replaced both driver's and passenger's side links. US $15 Driver's window switch failed. 125000 mi Original struts need replacement. US $16 Replaced hazard flasher switch. C $95 Repaired a hole in exhaust pipe located after the resonator. C $227 Had to replace evap control valve solenoid in order to pass emissions test. 168640 mi Needs a new catalytic converter. US $1336 Leaking Intake Manifold Gasket Replaced leaking axle boot. Replaced both transmission cooler lines Water and condensation in both headlight assemblies. US $1456 ABS and trac control malfunction - replaced both front wheel hub assemblies. US $2295 Frequent activation of Traction control system for no apparent reason. Barely noticeable rough shifting. Computer diagnostic indicated transmissions problems. Transmission rebuilt. US $517 Car suffered intermittent stutters in engine power, usually at cruising highway speed. After a week, Check Engine light came on. Computer indicated Fuel Air sensor. US $800 Both headlights have severe condensation. To pass inspection they needed to be clear - headlamp assembly was $400 ea. Instead we took them apart, wiped them out, and passed insp. Since then they are fogged over again. Lame! US $10 Blown fuses to the 12V outlets front and back. DIY replacement. US $85 replaced right axle (CV joint) Cost is part only - labor was DIY. US $550 I brought the car to have tires installed and an alignment. They found a worn drivers side tie rod and both front wheel bearing packs worn out. These bearings are supposed to last for the life of the vehicle. Totally unacceptible!Not under warrantee. US $15 Installed water deflector over cabin air filter to stop leaking of water into interior. Also repaired corroded wire to amplifier that was caused by extended exposure to water. C $1300 would not start told it was ignition then BCM. US $650 Check engine light on - replaced thermostat. Replaced lower control arm bushings due to thump under car. US $150 Discovered front driver-side coil spring was broken, and the car was slightly lowered on that side as a result. Replaced entire strut. Front passenger-side coil spring had hopped the seat as well, replaced around the same time. US $480 Both rear struts replaced because of broken coil springs. Front left outer tie rod end worn and replaced as well. Cracked exhaust resonator replaced. 198000 mi Blown rear headgasket resulting in numerous other repairs. See our lemon odds and nada odds page to see vehicles with no repairs or vehicles with more than three repairs. To see how frequently 2002 Chevrolet Impala / Monte Carlo problems occur, check out our car reliability stats.